About Puerto Rico, smart recommendations about the cuisine, activities, attractions and accommodation options are listed. Although some people think that Puerto Rico is a single island, it is actually an archipelago of islands, the largest of which are Puerto Rico, Vieques, Culebra, and Mona. As it is a territory of the United States, one of its official languages is English. Before the U.S. came into possession of the territory, the group of islands had been under control of Spain for over 400 years. Spanish, therefore, is also considered a primary language and is spoken more frequently than any other. That being said, a visitor from Spain might have a hard times understanding Puerto Ricans at times, who have developed their own variations in vocabulary and syntax. The island of enchantment is right! Visitors to the island will be mystified by the beautiful mountain ranges, rivers, lakes, tropical rainforests, and coastal regions. Throughout these areas people can see lush plant life and a wide variety of animals. Culturally, the islands are strongly influenced by music, and traditional rhythms that have both Spanish and African origins. 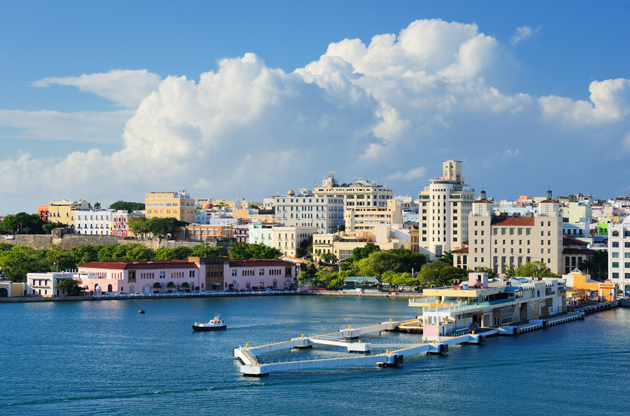 Puerto Rico also enjoys a robust economy that is among the most competitive ones in Latin America. Many guests who arrive on the main island of Puerto Rico choose to stay in one of the larger cities, such as Bayamón, Carolina, or the capital, San Juan. Whether looking for adventure, a relaxing beach experience, or a lively night on the town, there’s something for everyone in Puerto Rico. The islands are rich in culture, from music festivals to historical landmarks and museums. The latter includes the Puerto Rico Museum of Art, full of Puerto Rican pieces from the 17th century; the Wildlife Museum, which boasts over 200 animals in their natural habitat; and Casa de Libro (House of the Book), which holds important documents from the territory’s history. There are also several local theaters that host operas, concerts, theatrical productions, and cinematic events. For those more musically inclined, music venues such as the main island’s attractions offer a large diversity of events where visitors and islanders can take in the popular local dance styles of Bomba, Plena, Danza, Salsa, and Reggaetón. In certain times of the year, visitors may also be able to catch one of the lively festivals, such as the San Sebastian Street Festival in January, which commemorates the life of Saint Sebastian and where participants can enjoy local cuisine, music, art, and cocktails. Lastly, history buffs can get their fill by visiting any one of the islands’ historical sites, including the San Juan Bautista Cathedral; the Castillo Serallés, the lavish mansion of a turn-of-the-century aristocrat; and the Tibes Indigenous Ceremonial Center. To get the unique shopping feeling Puerto Rico offers, travelers should focus on the local artists who populate the many craft centers. Many of them encourage shoppers to tour their studios and gain an understanding of how their crafts are made. Some of these artistic pieces include religious carvings, small statues, and decorated masks. In the craft centers tourists will also find souvenirs, gifts, and pottery. For people looking for more traditional goods, the islands also sell common items such as tobacco, alcohol, and perfumes – often at duty-free prices! The most popular area for shopping is on the main island of Puerto Rico in the territory’s capital, San Juan. Although San Juan doesn’t offer the same duty-free benefits as other parts of the island, it is a hub of stores where people can find jewelry, fine china, crystal goods, and fashion for men and women. Perhaps Puerto Rico’s most common food is the plantain. Sometimes they are cut into patties and fried. Other times they are ripened and made into sweet maduros. Still other times they are mashed and stuffed with meat or vegetables. There’s also the famous asopao, a soup made with zesty seasonings and combined with chicken, rice, and vegetables. The Saborea is an annual food festival that over the years has become an important occasion for chefs and food fanatics from all over the Caribbean. It lasts an entire weekend and is marked by a sea of food pavilions and celebrity chef competitions. The tourism company also endorses a number of mesones, or local restaurants and cafes renowned for their superiority and commitment to serving local cuisine. Some of these include the Resaurante Pasión por el Fogón, the Starfish, and Daniel’s Seafood in the eastern part of Puerto Rico; Tres Amigos and Perichi’s Steak and Sea in the west; Restaurante Su Casa and La Colina 360 restaurant in the north; and El Ancla, Pito’s Seafood, and Restaurante el Roble in the southern part. People should remember to dress informally during the day in this tropical climate. At night, however, it’s a different story. Puerto Ricans dress up when going out at night, and those who don’t will quickly identify themselves as tourists. Travelers from the United States should not assume they can get by on their English just because the islands are a U.S. territory. Spanish is the dominant language, and locals appreciate tourists’ attempts to converse in the native tongue. The best time to visit is from April to June, right after the crowded winter season is over but before the rainy season starts. Weather around this time is not as comfortable as the winter months, but temperatures usually don’t creep higher than the mid-80s. Before your arrival it will be beneficial to check if you need a visa or not to enter the country. Traveling to Puerto Rico from the United States does not require any type of visa, and does not even require a passport. For people from other parts of the world, visitors must go through the same process they would to enter any other part of the United States. You can have more detailed information on U.S Department of State Website . Being a melting pot of cultures, Puerto Rico offers an inspiring setting for sector leading global events such as conferences, congresses, tradeshows, fairs, exhibitions and symposiums. Thanks to its growing economy and favorable climate, Puerto Rico remains as an ideal hub for international meetings and its luxurious hotels, world class venues with great facilities add up to this advantage.